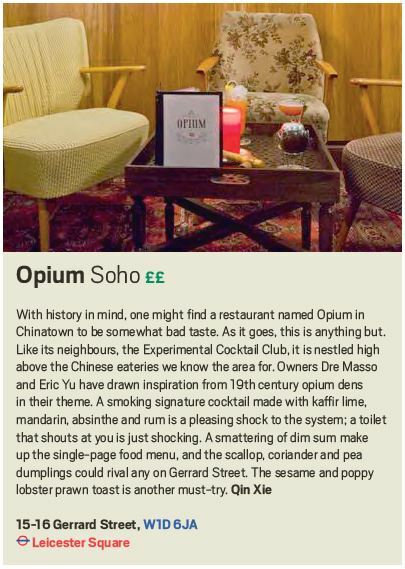 With history in mind, one might find a restaurant named Opium in Chinatown to be somewhat bad taste. As it goes, this is anything but. Like its neighbours, the Experimental Cocktail Club, it is nestled high above the Chinese eateries we know the area for. Owners Dre Masso and Eric Yu have drawn inspiration from 19th century opium dens in their theme. A smoking signature cocktail made with kaffir lime, mandarin, absinthe and rum is a pleasing shock to the system; a toilet that shouts at you is just shocking. A smattering of dim sum make up the single-page food menu, and the scallop, coriander and pea dumplings could rival any on Gerrard Street. The sesame and poppy lobster prawn toast is another must-try. Tonkotsu is the sort of place you can follow your nose to; the bubbling stock-pot by the window is surely designed to lure in passers-by. Owned by the people behind Tsuru Sushi, this new venture skilfully rides the wave of noodle fever currently flooding Soho. 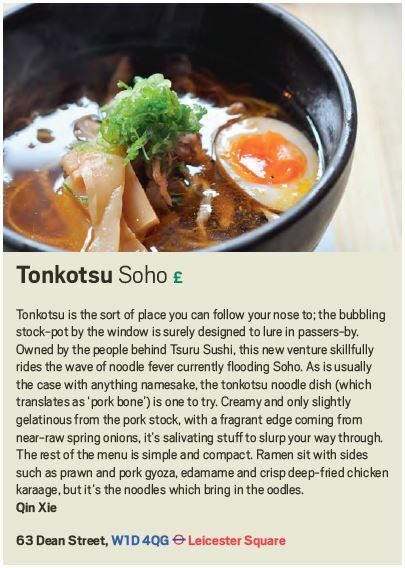 As is usually the case with anything namesake, the tonkotsu noodle dish (which translates as ‘pork bone’) is one to try. Creamy and only slightly gelatinous from the pork stock, with a fragrant edge coming from near-raw spring onions, it’s salivating stuff to slurp your way through. The rest of the menu is simple and compact. Ramen sit with sides such as prawn and pork gyoza, edamame and crisp deep-fried chicken karaage, but it’s the noodles which bring in the oodles. London’s restaurant scene isn’t short of Scandinavian influence, and this is another concept to hail from Copenhagen. 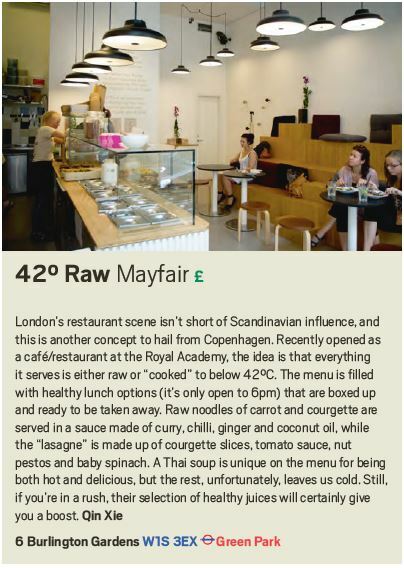 Recently opened as a café/restaurant at the Royal Academy, the idea is that everything it serves is either raw or “cooked” to below 42ºC. The menu is filled with healthy lunch options (it’s only open to 6pm) that are boxed up and ready to be taken away. Raw noodles of carrot and courgette are served in a sauce made of curry, chilli, ginger and coconut oil, while the “lasagne” is made up of courgette slices, tomato sauce, nut pestos and baby spinach. A Thai soup is unique on the menu for being both hot and delicious, but the rest, unfortunately, leaves us cold. Still, if you’re in a rush, their selection of healthy juices will certainly give you a boost.